Granita is the perfect fresh, fruity, icy treat for hot summer days. 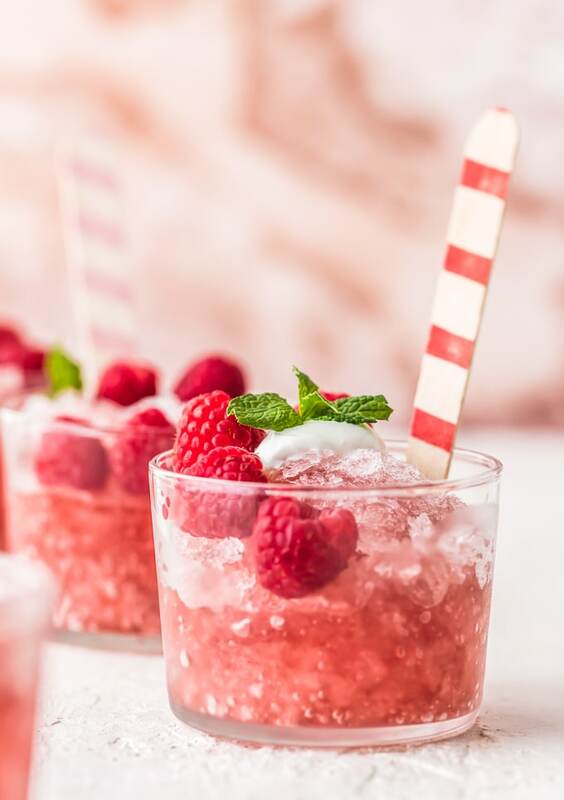 This Raspberry Rosé flavor is my favorite kind to serve at brunches, bridal parties, or just on a fun summer afternoon. This granita recipe only has 4 ingredients, so it’s easy to make, plus you can switch things up and use the same process to make other flavors any time you want! 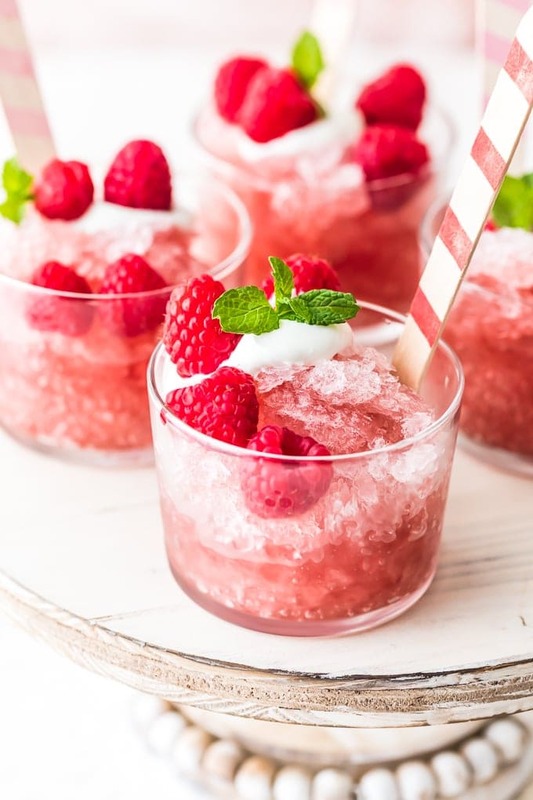 This Raspberry Rosé Granita recipe is one of the best and most fun summer dessert recipes. 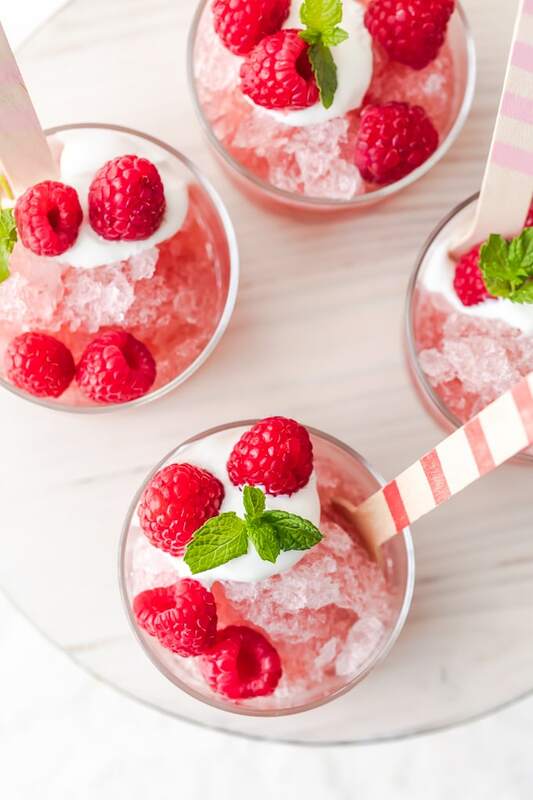 I love serving this icy treat on hot days and at summer parties of all kinds. Granita is a fruity, icy dessert similar to Italian ice and sorbet, but not quite the same. 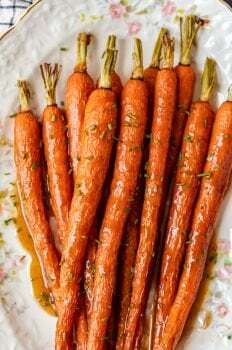 It has a nice coarse texture and it tastes to fresh and juicy. I like this rosé version for a fun treat at brunches, bridal parties, or a girls get together. It feels a bit luxurious and tastes so good! You could also make lemon, watermelon, or this delicious orange cream flavor. Whatever flavor you choose, granita is a fun dessert whether it’s served alone or with ice cream! 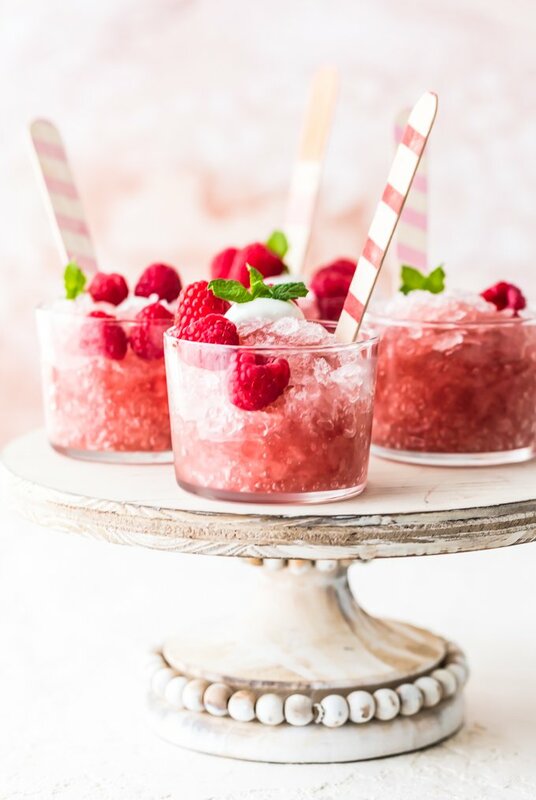 Make this fresh and fruity Raspberry Rosé Granita recipe for a fun summer treat! Granita is a frozen, icy dessert that originated in Italy. It’s similar to both sorbet and Italian ice, so it’s easy to get these three things confused. Are they basically the same thing, or is there a real difference? Granita, sorbet, and Italian ice are all sweet, frozen desserts mostly made from sugar, flavorings, and ice/water. The main difference between the three is the texture and the way the are made. Sorbet and Italian ice are both quite compact like snow cones and usually made with machines, while granita is more coarse and chunky and is made by hand. They are all fruity, icy, and refreshing, but granita is my favorite to make! This is the perfect summer dessert recipe! It’s icy, cool, fruity, and refreshing. There’s nothing better to serve on hot summer days. This simple treat will quickly cool you down. And for an even cooooler dessert, mix it with a scoop of ice cream! One of the best things about this treat is that you can make it in so many different flavors. I looooove this raspberry rosé flavor because it’s sweet, juicy, and has the perfect kick of alcohol. Of course you don’t have to make an alcoholic version though. 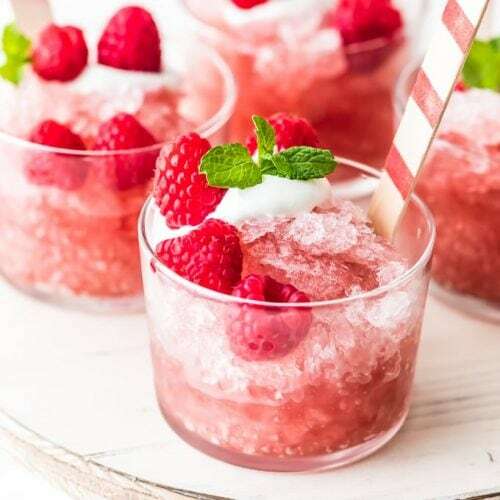 You can make lemon, raspberry, watermelon, almond, coffee, orange…there are so many possibilities with this granita recipe, and they all require the same process to make. 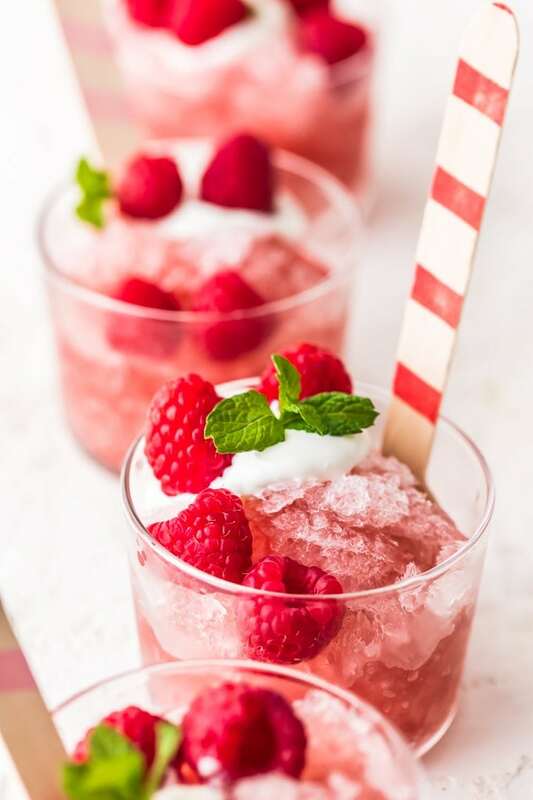 This raspberry rosé granita recipe is really simple to make, although you do have to give it time to freeze. But once it’s made, you can keep it in the freezer and keep going back to it all summer long. I recommend letting this sit out for about 10 minutes before serving to let it get a bit melty and juicy. Granita is so much fun to serve at parties or after dinner. 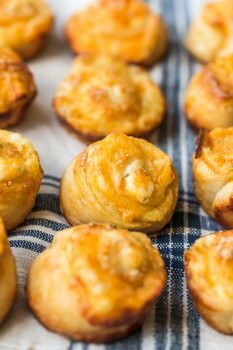 These really do make a great treat for brunches, bridal showers, or any summer afternoon on the porch. This raspberry rosé flavor is especially fun because it’s pink, pretty, and it has a decadent kick. Serve it in a small glass or bowl, sprinkle in a few fresh raspberries, and top with a bit of cream and mint. It’s the perfect party dessert! Another fun way to serve it is in a bowl with ice cream and fresh fruit. I love the way the icy texture mixes with the creaminess of vanilla ice cream. That’s how we served our Orange Cream Granita and it was so good! 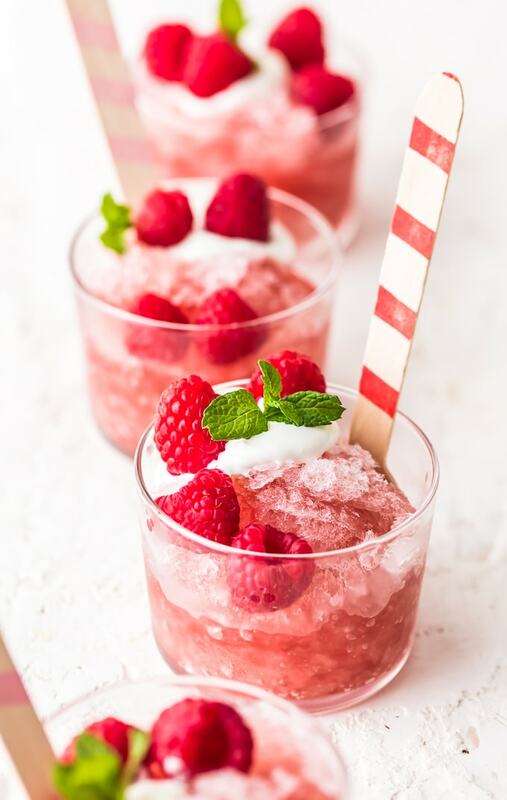 You guys are going to love this refreshing Raspberry Rosé Granita recipe! Make a batch to keep in your freezer and serve it all summer long for the perfect summer dessert recipe. 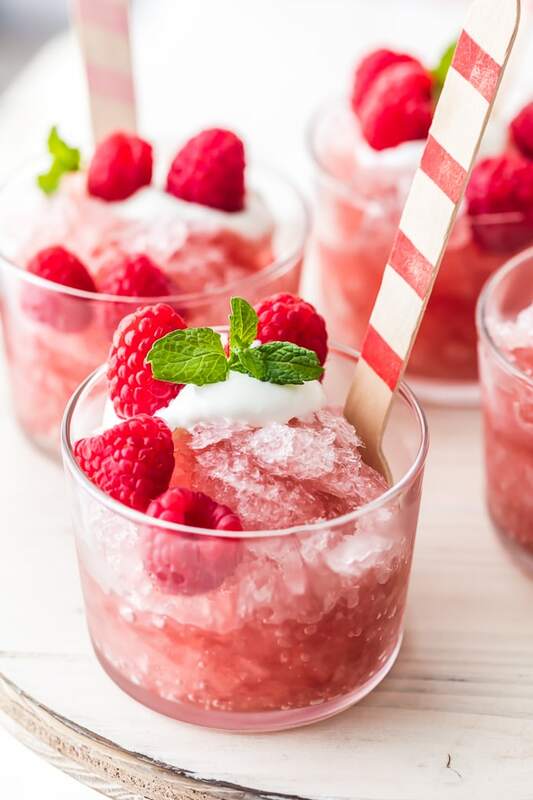 See the recipe card below for details on how to make Raspberry Rosé Granita. Enjoy! 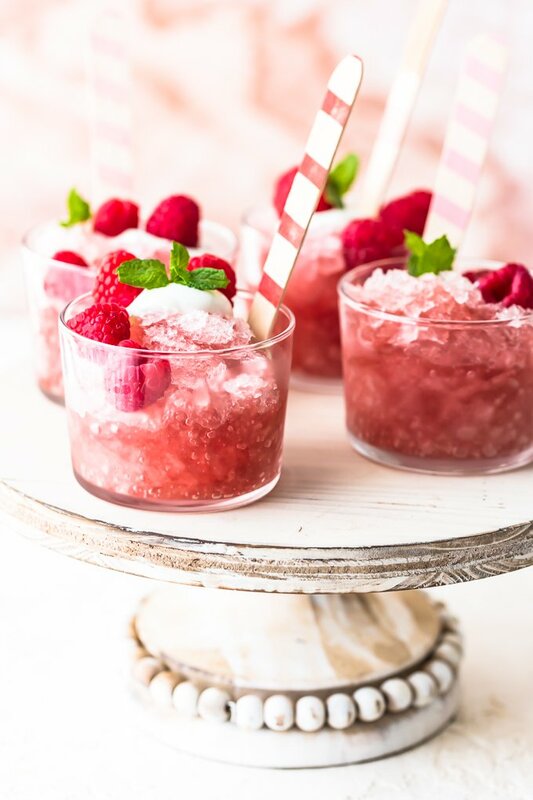 Raspberry Rose Granita is the perfect treat for hot summer days. 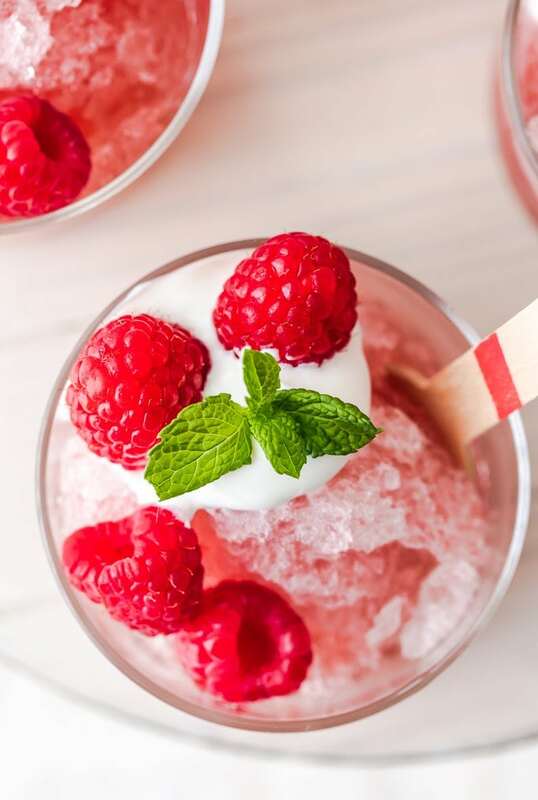 This fresh, fruity, icy dessert can be made in so many flavors, and this raspberry rose flavor is sweet and juicy. Pour the rosé and sugar in a large bowl and stir until sugar is dissolved. Add in the water and Chambord and stir until blended. Pour into a shallow freezer container, cover and freeze at least 2 hours until the top and edges are beginning to freeze. Use two forks to break up the ice crystals and stir. Repeat this every hour or so until completely frozen. Once frozen you can keep this in the freezer up to 2 months. When ready to serve, transfer to room temperature 10-15 minutes before serving. Serving suggestion: Serve by itself or with vanilla ice cream or raspberry sorbet. Drizzle lightly with Chambord.